A phenomenological study conducted by Kerrie Montgomery in November 2016 toward completion of her Ph.D. in Higher Education at the University of Denver, revealed three distinct but interrelated transition types experienced by Chinese Undergraduate students during their first year of enrollment at colleges and universities in the U.S.: academic, social/personal, and linguistic. Study participants represented both first-time-in-college (FTIC) students, and students who transferred from institutions in China, Panama, and Switzerland. Despite transfer students’ transition experiences at their previous international institutions, all the participants had similar difficulty making friends and adjusting to academic norms. Furthermore, insufficient language preparation exacerbated difficulties in both the academic and social/personal domains. Motivations for pursuing a degree in the U.S. were similar for all study participants in that, whether through encouragement from their parents or their own decision-making, they all desired and expected to have greater job opportunities and career preparation upon earning a degree from a U.S. institution. Beyond academic preparation, participants expected the relationships they would create with U.S. students to aid them in both improving their language skills and beginning to establish a network of future colleagues. Most participants believed they were linguistically well prepared based on their TOEFL scores. As a result, many were surprised to find that they did not have a strong understanding of basic, practical vocabulary and syntax. This prevented them from communicating easily and effectively with their domestic peers both in the classroom and in social situations, or to do simple tasks. The linguistic, academic, and social/personal transitions experienced by these students were analyzed using a framework of Schlossberg’s Transition Model (Schlossberg, Waters, & Goodman, 1995). The results of this analysis provided insight into sources of institutional support found to be present or lacking at the participants’ institutions, and led to the development of several recommendations for practice. Orientation materials and programs should be delivered in multiple formats prior to and upon arrival. – Online content should be made available prior to students’ arrival. This should include resources for securing housing, information about on-campus orientation and logistics for getting to campus, and “cheat sheets” of basic vocabulary that can be referred to on an ongoing basis. – A mandatory in-person orientation program should be provided upon students’ arrival to campus and should be offered by International Student and Scholar Services (ISSS) in collaboration with the Orientation/New Student Programs department. In addition to the validation of immigration documents, this program should offer information provided to all new students about how to: obtain ID Cards, receive academic advising, and register for courses. This program would also allow students to meet peers and begin forming relationships from the time of arrival. – Printed materials, translated to Chinese and other languages, should also be provided to students at the in-person orientation to ensure that information has been received and can be referred to after the program. Handouts should include step by step guidelines for registration, information about the importance of academic advising, and other essential resources. Interactive workshops and programs should be made available on an ongoing basis to address academic issues (classroom norms and structures, test-taking, etc. ), social interactions, and language improvement. On-campus housing should include intentional roommate matching with domestic students who are interested in supporting Chinese students through all three transition types. Off-campus housing information should be provided to maximize opportunities for placement with domestic students rather than other Chinese students. Faculty should be intentional about connecting with Chinese students and fostering welcoming environments for them in their classes, as well as providing content in multiple formats that reinforce classroom delivery. 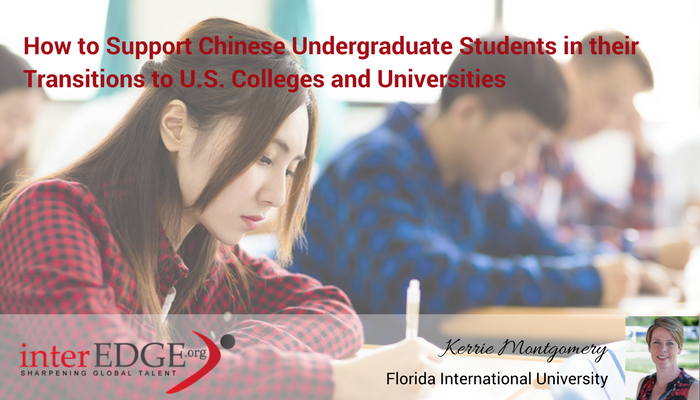 With the enrollment of Chinese undergraduate students increasing at U.S. institutions, what best practices are being employed to support them? How can institutions become better prepared holistically to welcome and support this student population on our campuses? This blog article was contributed by Dr. Kerrie Montgomery. She is Director of Campus Life at Florida International University, Biscayne Bay Campus. She holds a Ph.D. in Higher Education from the University of Denver, a Master of Education and a Master of Arts in Art History from University of Florida.